The railings you select for your property is not a decision you want to make hastily. A shoddy rail system doesn't inspire confidence with guests and can be dangerous. Some materials might look great in the beginning, but high-maintenance costs over their lifetime can easily negate any initial savings. They can even reduce your property's overall value, not too mention its appearance. You can avoid all this by selecting one of the aluminum railing systems from Superior. Superior offers a full-line of residential, commercial, and industrial aluminum railings that complement any design without distracting from it. Designed to meet required federal, state, and local safety codes - and look good doing it - they project the image you deserve. 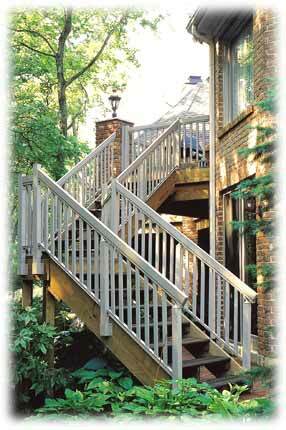 Aluminum railings offer numerous advantages over wood or steel railing systems. It will never split, warp, or rot due to rain, ice, sun or other elements. It is significantly lighter than other materials allowing for easy installation. Finish options of baked-on enamel, anodized, or duranodic ensure years of corrosion-free and maintenance-free service.